"The glass-fronted compartments and shiny, nickel-plated fittings created an impression of clean, sparkling conditions and also gave an illusion of effortlessness; all the labor went on behind the scenes," wrote Philip Langdon in Orange Roofs, Golden Arches (1986). 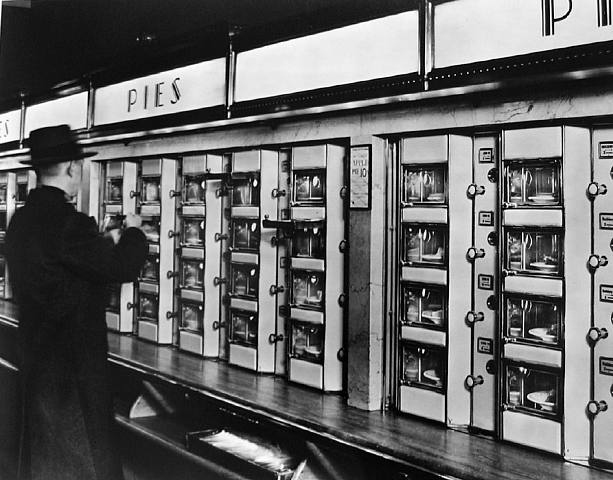 Horn and Hardart called their restaurant an "automat." The newspaper called it "a boon to thousands of hungry business men and women." The cubbies, glass doors, and coin mechanisms were the product of a German firm that made food vending machines for European train stations. A decade later, Horn and Hardart designed and built their own version of the mechanism for their new flagship on Times Square in New York City. The StratoSnak was intended to present fully-automated food service to Tomorrowland visitors. Designers at WED imagined the ultra-clean array of glass doors found at an east coast Automat, executed in sci-fi, mid-century modern materials. The art directors' lack of retail entertainment experience was revealed by Walt Disney Productions' partner, United Paramount Theaters. 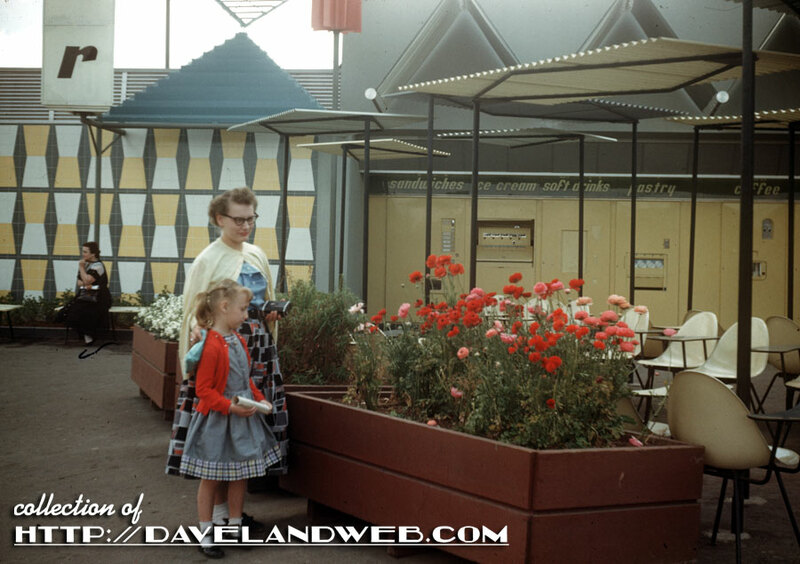 UPT operated thousands of theaters that sold popcorn, candy, soda, and hot dogs in large quantities at high markups. Granted the food concession for Disneyland, UPT ensured that there were sufficient joints—two per land, except Adventureland and Main Street—to satisfy hungry and thirsty guests. UPT opted for a basic "grab stand," a term from the carnival and traditional park industry. A grab stand is a 10-foot by 10-foot kitchen with a serving window. Hamburgers are grilled, potatoes fried, and syrup mixed with carbonated water in the kitchen. Soda canisters and kitchen trash are outside in the back or in an enclosed yard. Customers pay, grab their food, and find a seat at a table nearby. No waitresses, no silverware or dishes. A cook, a cashier, a utility man, and someone to handle trash in the table area—grab stands are very profitable to operate. 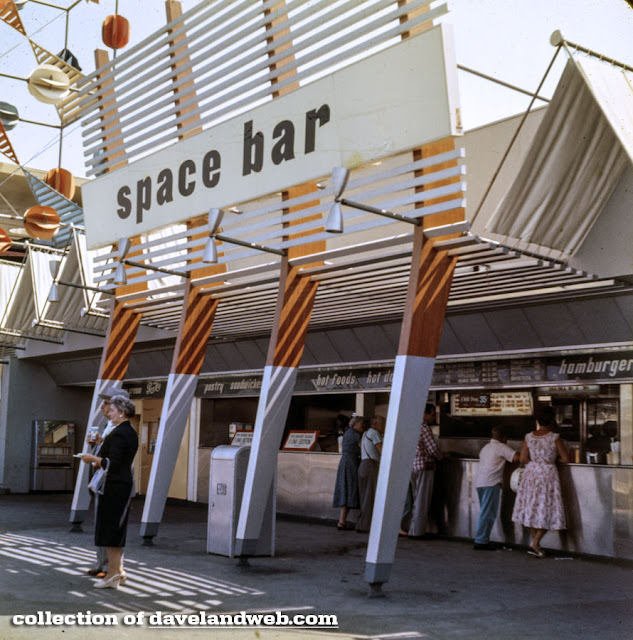 StratoSnak, the "super-automatic eating place of the future," became the Space Bar, a basic grab stand with the addition of a row of vending machines—super automation! 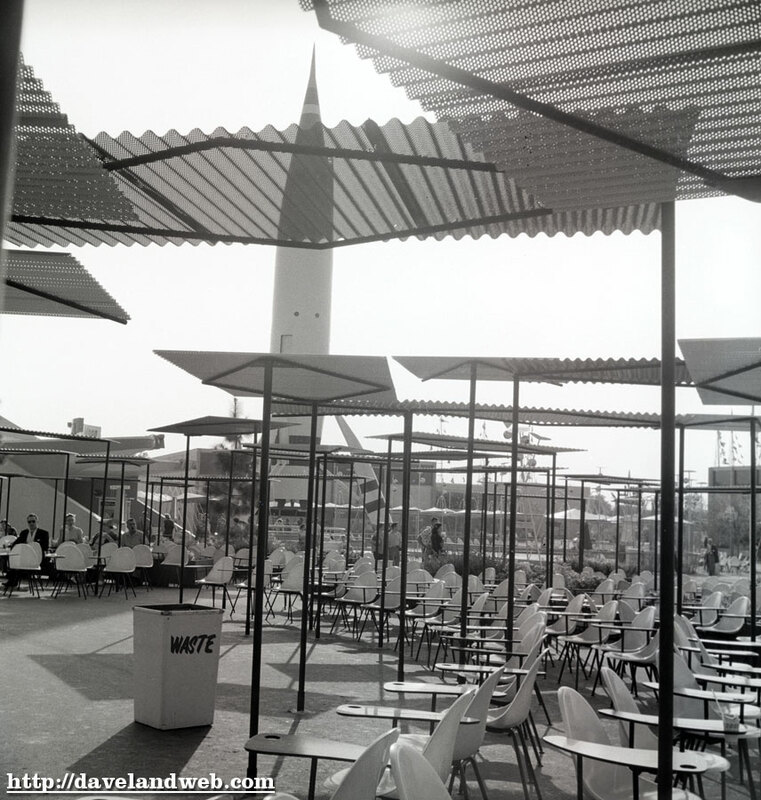 The tables and chairs at the Space Bar were even more "advanced" than at other food joints in the park. These were molded fiberglass chairs with a table top attached (later seen in college lecture halls). The chairs were corralled by a semi-circle of planters and the hot asphalt paving was mitigated by minimalist shade squares on steel frames. 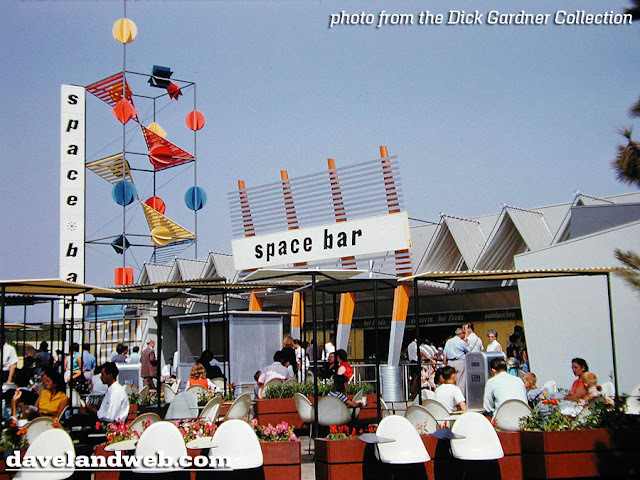 As bleak as it sounds, the architecture of the Space Bar was delightful. A tower made from a simple pipe frame held all kinds of colorful spinners and the facade was enlivened by a zig-zag made from taut canvas. 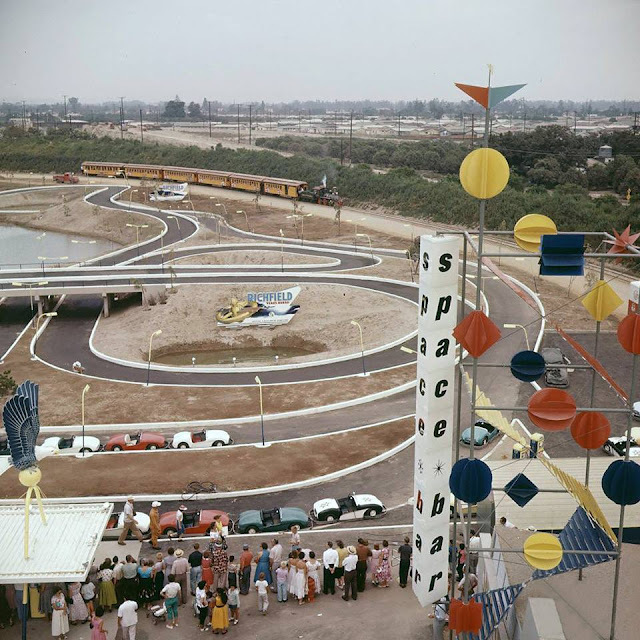 The animated tower predated Rolly Crump's Tower of the Four Winds at the New York World's Fair (1964) and the dashes of shape and color were not unlike Jon Jerde's designs for the Los Angeles Olympics (1984). Not bad for such an inexpensive—yet profitable—building. Everything on the tower moved with the breeze.